Among several new releases to emerge in the early 1930s, 1933-34 V288 Hamilton Gum Hockey is a relatively small set. However, it contains many different cards for advanced set collectors to chase. On one hand, it represents one of the more easily-obtainable sets of its era. But, for completists, it can be a pain to collect. 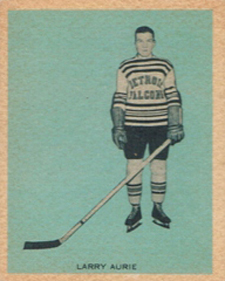 1933-34 V288 Hamilton Gum Hockey card fronts feature a black-and-white player picture superimposed against a solid-colored background. Backgrounds come in four different colors: blue, orange, green or beige. The player's name appears at the bottom of the photo, and a white border surrounds the card. Backs begin with a card number and player's name, followed by his position and team. Biographies in English and French follow, along with an advertisement for Puck Gum. A line for Hamilton Chewing Gum runs along the bottom. There are 21 cards in the complete 1933-34 V288 Hamilton Gum Hockey set, but they are skip-numbered through 49. Each card can be found with the four tints, which makes collecting a master set an exercise in itself. Key players in the set include Howie Morenz, Aurel Joliat, King Clancy and Charlie Conacher. 1933 34 V288 HAMILTON CHEWING GUM HOCKEY CARD #36 ALEX LEVINSKY KSA 2 GD NICE!! 21 cards. Set is skip-numbered. Each card is available in four tints. 1933 34 CANADIAN CHEWING GUM V252 HOCKEY CARD HARVEY BUSHER JACKSON PSA 1 NICE! !